Just a few months ago, the idea of getting together with nearly 100 people for an all day strategy discussion on any progressive issue in Atlanta would have seemed wildly optimistic. And one just for Palestine? Not a chance. Our on-again, off-again organization Atlanta Palestine Solidarity had called it quits in 2008 after almost five years of educational events and demonstrations, leaving key activists burnt out and scattered. As in many places, though, the Palestine solidarity movement is building with new vigor due to recent developments. First, the objective factors: Israel continues to outdo itself in its brutality against the Palestinians. In the wake of Israel’s military assault on Gaza, we saw an inspiring upsurge of mass demonstrations across the world in solidarity with Gaza and Palestine. Atlanta was host to six demonstrations in rapid succession held at the Israeli consulate and CNN Center. These demonstrations brought together 200-700 people, mostly Palestinian and other Arabs and people with Southwest Asian ancestry. Relative to all other Atlanta demonstrations over the past few years, this is an unusually high number. Several of these demonstrations culminated with spirited (and unpermitted) marches through Atlanta streets, one of them impromptu, where frustrated police blocked off a busy street seeing that they were incapable of keeping the crowd on the sidewalks in front of the Israeli consulate. Organizers of the demonstrations were an ad hoc group of activists from a variety of movements. This group saw the organizing potential in the large numbers that came out to the demonstrations and decided to call for a mass meeting to discuss building a long-term Boycott, Divestment, and Sanctions campaign. The reasons for adopting BDS are two-fold. One, this is a way of taking leadership from Palestinians in the struggle against Israeli apartheid. 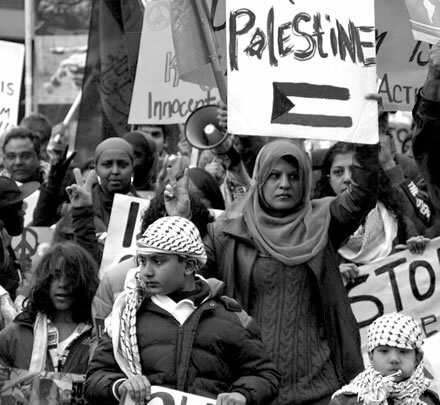 In 2005, over 200 Palestinian civil society organizations called for international solidarity activists to adopt this strategy in order to isolate Israel much like apartheid South Africa. The second reason is related to the actual potential and momentum of BDS, which is increasingly demonstrated across the world. These are the subjective factors that may have game-changing potential in our Palestine solidarity movement. Over the next few weeks between the demonstrations and the mass meeting, this ad hoc group got to know one another, formulated a basis of unity (check it out below), sketched some possibilities for BDS work in Atlanta, and put together an agenda for the meeting. This group included student activists from University of Georgia, Georgia State, Emory, and Georgia Tech, members of several socialist and nationalist groups, an activist that works for the Carter Center, and an AFSC staffer involved in anti-war and youth organizing. The meeting would serve as the launching pad for a new organization, the Movement to End Israeli Apartheid-Georgia (MEIA-G; website under construction at meiag.org). This group, unlike previous Palestine solidarity efforts in Atlanta, would be focused on BDS work. MEIA-G activists are hopeful that the BDS strategy will yield consistent campaigns that people in Georgia can relate to and build. 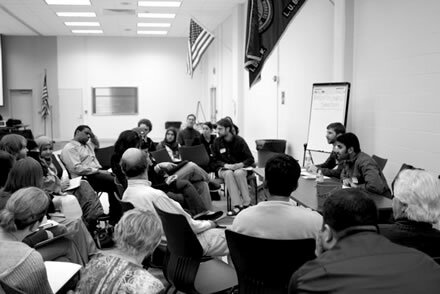 The launch meeting held on February 7 brought almost 100 folks together for a day-long education and strategy session. Participants were given packets including the mission statement of the group, the Palestinian BDS call, and a paper explaining the “apartheid” framing of Israel. The meeting began with a touching and militant message (via Skype) from Dr. Haider Eid, a professor at Al-Aqsa University in Gaza. “Hearing from an insider,” one participant noted, “helped affirm people’s commitment and reminded everyone of how necessary and urgently needed the actions we are taking are.” The meeting then broke out into smaller groups to discuss possibilities for long-term campaigns. One organizer, a recently-moved supporter of the Canadian Union of Public Employees endorsement of BDS in Ontario, led a workshop on the origins of the strategy, its implementations across the world, and possibilities in Atlanta. Though a BDS strategy is being adopted globally, every utilization has to account for local factors. Like most successful campaigns, this requires mapping out your community, allies, big institutions in your region, and possible connections you have that can be useful. Because this isn’t a “one size fits all” package of tactics, MEIA-G is charting out how people in Georgia can express solidarity with Palestinians and join the global movement to isolate the Israeli apartheid state. Due to especially low union density in the Southern US, it’s doubtful that massive showings of workers’ solidarity like in South Africa or Ireland will be a motive force in our campaigns. MEIA-G is focusing on building support within the Palestinian/Arab/SW Asian communities in Atlanta as well as providing critical support to student-led campus divestment campaigns. The recent victory at Hampshire College is proof that the time to utilize these tactics has come. The writers of this report, both graduate students at Georgia State University (GSU), introduced research on a shocking local connection to Israeli apartheid: the Georgia International Law Enforcement Exchange. This program, housed in the Criminal Justice Department at GSU, provides “study abroad” opportunities to Georgia cops where they can learn all they want from the Israeli National Police and Israeli Defense Force. In a society that routinely racially profiles, tortures, arbitrarily detains, and shoots Palestinians, it’s doubtful that respect for basic human rights fits on the curriculum – and that latter lesson is the only one Georgia cops have consistently failed to learn. Here in a state with its own history of apartheid, we plan on working with other communities of color to cut these ties. There is also considerable energy from other campuses, with students eager to research their institutions as well as people wanting to boycott individual products (though we think the potential in this latter strategy is minimal). Plans were made for working groups to meet again, and another mass meeting is planned tentatively for May. A “skills bank” collected information from dozens of supporters with a variety of skills, from graphic design to translation. The main weakness of the meeting was a lack of representation from Palestinian/Arab and SW Asian communities proportional to their participation in the demonstrations. A tour of outreach meetings across Metro Atlanta masjids and campuses has been plotted to continue MEIA-G’s base-building work. 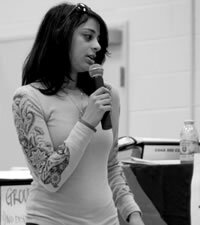 Organizers in Atlanta have an incredible opportunity to develop a BDS campaign, the first of its kind in the South, that engages not only Palestinian and Arab communities in exposing and severing ties to Israel but also connects the oppression of Palestinians to communities here in Atlanta. We are a group of individuals from a wide range of backgrounds who stand in solidarity with the Palestinian people in their struggle for liberation. We oppose the apartheid state of Israel and its efforts to colonize the land of Palestine and ethnically cleanse, occupy and oppress its indigenous population. We work, live and study here in Georgia, where we recognize the connections between rights and justice struggles in Palestine, and the broader struggles against exploitation, racism and sexism in the U.S. and across the world. These systems of apartheid are interlinked; we must commit to dismantling all if we wish to dismantle any. Refugees: The colonization of the land of Palestine and the creation of the state of Israel in 1948 led to the expulsion of over two-thirds of the Palestinian people. This population now numbers over six million, the largest refugee population in the world. Israel has consistently denied their right of return, despite allowing anyone of Jewish background from anywhere the automatic right to become an Israeli citizen. Occupied Palestinians in the West Bank and Gaza: In 1976, Israel occupied the remainder of historic Palestine, the West Bank and Gaza Strip, thereafter implementing a systematic policy of land confiscation, house demolition and settlement building designed to further displace Palestinians from their lands and confine them into ‘open-air’ prisons. Palestinian ‘citizens’ of Israel: Israel imposed citizenship on those Palestinians whom it did not expel from the borders established in 1948. Due to their ethnicity, they have been denied equal rights to those of the Jewish population in Israel, and face a range of discriminating and marginalizing polices and practices. The US government plays a crucial role in supporting this settler-colonial project and its apartheid policies. It gives over $3.5 billion in military and economic aid to Israel every year. This is despite Israel’s violation of more UN resolutions than any other country in the world. As individuals living inside the US, we pledge ourselves to work towards the end of US support and protection of apartheid Israel. We reject all forms of racism, anti-Semitism and Islamophobia. Some of these same dynamics played out in New Orleans, with the largest Palestine demonstrations ever in the city, including marches into the French Quarter on a busy Saturday. Young Palestinians and Arab students are taking active leadership roles and building student organizations on campuses, including GUPS – General Union of Palestine Students- at the University of New Orleans. Speaking of Palestine solidarity organizing in the South, it would be unfortunate to go without mentioning developments in New Orleans! We in MEIA-G hope to discuss strategy with these comrades soon.